December 2016 - We're delighted to announce that Contemporary Controls has been nominated for six ControlTrends Awards. First the Cubs win the World Series, and now this. 2016 has been an exciting awards season for Contemporary Controls. We're especially proud that our "Understanding BACnet Video Series" is a finalist for "ControlTrends Most Impactful Video of the Year". Contemporary Controls has always been committed to improving the innovation and technological advances of the industry by providing as much free educational material as possible. The Understanding BACnet Series is an 8-part educational video series that is intended for those who are encountering BACnet for the first time or those who simply wish to review basic BACnet concepts. With over 56,000 views on YouTube, it is our most popular video. We're also pleased that Diego Mateo, on the front lines of our technical support team, is a finalist for "Best Technical Support Person - Small Manufacturer". If a customer has questions or technical issues with one of our products, our technical support rep, Diego Mateo, is the person who takes the call. 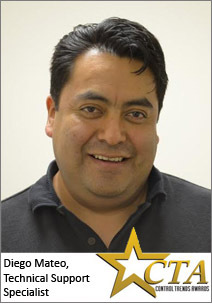 Diego has a background in installation and maintenance of HVAC systems, both theory and hands-on, so he brings expertise to the technical support team. "The temperatures are in single digits in the Chicago-area today, so I don't miss being on the roof trying to fix an HVAC issue," said Mateo. "I enjoy being able to help our customers resolve the different problems they encounter in the control field from our nice, comfortable office." Diego provides technical support for the company's products and services in both English and Spanish. He has an Associate degree in Applied Science/HVAC from Joliet Junior College and is EPA certified. Diego is also Niagara certified. "We're honored to be nominated in six categories," said George Thomas, President of Contemporary Controls. "The ControlTrends Awards ceremony is one of the most entertaining events in the industry, but it also serves the important function of recognizing the latest innovations and achievements in the Building Automation Industry." Be sure to pass along the link to the final ballot to your co-workers and colleagues, too.